Hello. 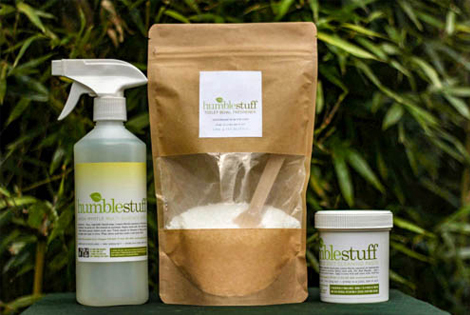 I'm Marie from humblestuff, and we are absolutely delighted to have our household cleaning products listed in the Naturewatch Foundation's Compassionate Shopping Guide. If some of you are wondering 'who are humblestuff?' then let me tell you a brief history of how it all began. I've been a domestic cleaner since 2005 when I left a well paid job in financial services to clean other people's homes. It may seem mad, but I knew that money was not my reason for getting up and going to work every day. I wanted to do something that I was passionate about, and for me, that's cleaning. Over the years, I've used a lot of different cleaning products, and I'll be honest, I never really thought much about what was inside, whether they were tested on animals, their effect on our health or what happens when they disappear down the drain. In 2013, I decided that I really didn't want to use any of the available products to clean my oven at home, so I started to research 'non toxic' oven cleaning. From that point I was converted, and never wanted to use any of the harmful products that I had been using again. It took and a lot of trial and error to finally settle on the recipes that form the basis for the humblestuff product range as it is today, but the main thing that I am learning from my ongoing research is that we all use too many different products in our home, and on our body. It was only as recently as the 1930's that scientists produced the first detergents for use in household cleaning, but they didn't gain commercial success until the 1950's when TV advertising began in earnest. Since then, there has been countless number of chemicals created from the by-products of the petrochemical industry for use in household cleaners. It is this never ending drive to create 'better cleaning' that has kept animals in the labs. We are just beginning to understand the harm that some of these chemicals do, and that's why we use simple and traditional ingredients like sodium bicarbonate, citric acid, vegetable soap and aromatherapy grade essential oils in our products. We are proud to list everything that goes in to our products, so that you can see quickly and easily what you are taking into your homes. Cleaning is our passion, but our aim so to promote and encourage as many people as possible to clean not only with compassion for the animals being tested upon, but for our own health and for the environment too.